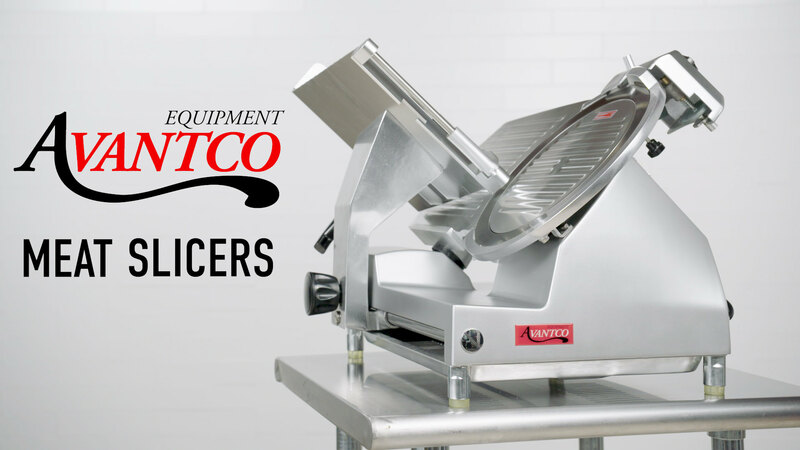 Adjustable thickness knob allows for precise slicing down to 1/16"
This Avantco SL312 12" manual gravity feed slicer features a compact design that's ideal for small operations where space is at a premium! It's great for slicing vegetables and processed meat, and it's easy to use with an adjustable slice thickness from 1/16" to 1/2". The Avantco 12" slicer is made of top quality aluminum for durability, and it comes with a built-in sharpening assembly. For easy cleaning, the meat carriage is removable, and it also has a fixed ring guard for safety. 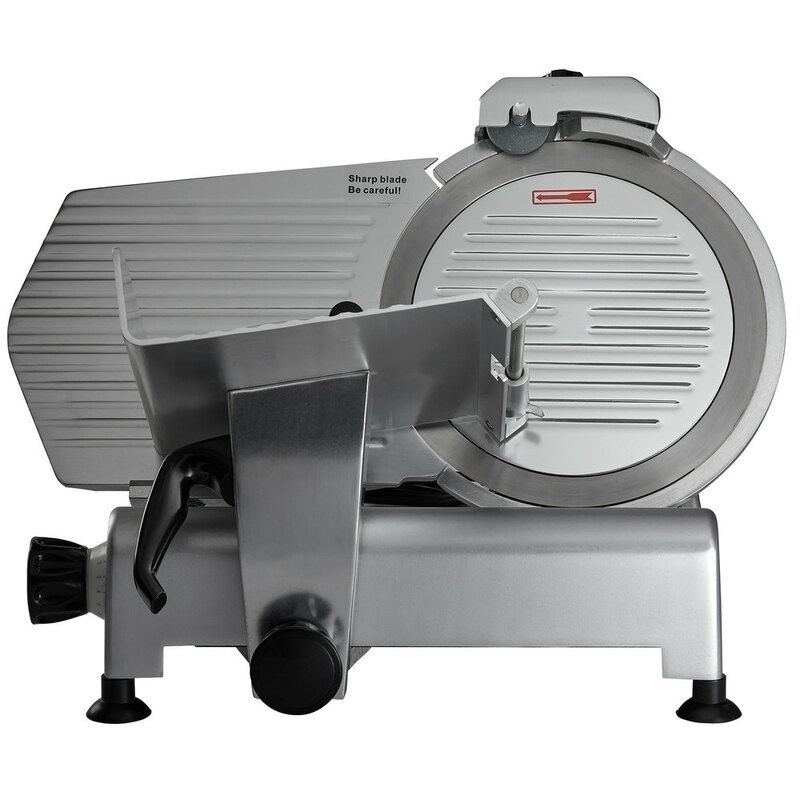 The slicer's stainless steel blade is belt-driven by a 1/3 hp motor. This slicer is excellent for low-volume applications of less than 1 hour of slicing per day. It is not suitable for continuous, heavy use, raw or frozen meat, or cheese. Maximum Product Size: 9" x 7"
We've head this slicer for about 6 months now. It works well for the amount of items we slice on it and is very smooth. Good slicer for medium usage. After using hobart and globe brand slicers in the past, this machine handles any job just as good as the other brands. I will be the same one in the future! This meat slicer from Avantco has really helped us save money. We are able to buy large quantities of meat and slice it ourselves for our crepes. It is smooth and easy to use. Would recommend buying! The size options are really what i needed. The arm that is usted to cut the Meat is really smooth and Easy to put. Great machine for our restaurant. This is a decent slicer for the money. It has a built in sharpener and an adjustable size selector. Definetely does the job for the money. It is a nice product. It works good, and is very easy to use. If you are starting your business it will good for you-expecially for the price-, but for professional use I don't recommend it. For the price this slicer is not a bad deal. If you are looking for a high quality slicer-this is really no it. 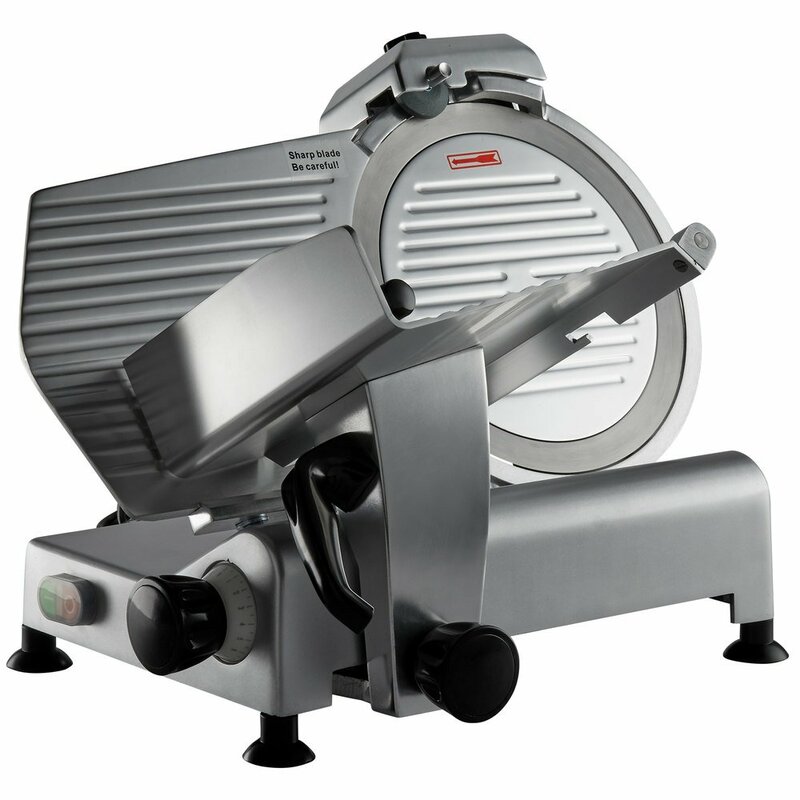 There is not a lot of safety feature with this slicer as with some of the higher quality ones. For minimal amount of slicing and a low cost option-this is the best product out there. This is a nice Slicer, it last 2 years and 8 months the motor went out.. Dad's is open from 7 am to 10 pm. 7 days a week. We just got the next model up with the 1/2 HP motor. Hope to get 5 years or more out of this one. Charles L. from Dad's Bar & Grill Restaurant in Empire La. This slicer was way better then expected, I bought it 4 years ago and its still going strong. Works great for my pizzeria cutting various cold cuts. Lowpriced but very good slicer. Great item! I shopped around thinking that the price of slicers resulted in their quality and I was wrong. This slicer holds up to daily use at two different restaurants and has never had an issue. For the number of times that we use this slicer (which is about medium duty), it met our expectation for the price. 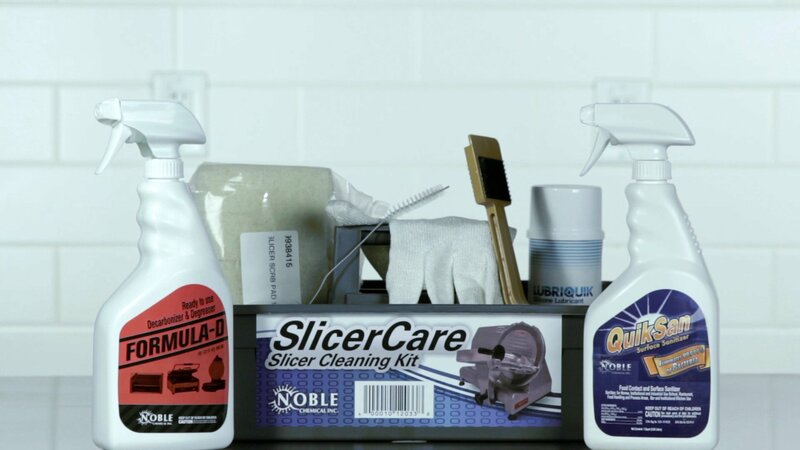 It works great and is easy to clean. I would not recommend it for a business that needs a heavy duty slicer. This slicer is light weight and easy to go from place to place. Perfect addition for off site events. Easy to clean and store. Worth the money. Purchased this for my new deli and love it, so easy to use and clean. Would totally recommend this product, can not beat the price and quality. I've only used this a few times so far, but it's been awesome. Slicing things super see-through thin and thicker with no problems. I almost got the bigger motor model but I think that would have been a waste of money and this guy works great. I've been using this for the last couple months and its been perfect. Being able to adjust the thickness is great and the bigger tray size allows for bigger slices. Brought the slicer to to slice homemade slabs of bacon. No issues cutting through a frozen slab of bacon creating uniform thickness slices. I was even able to cut slabs wider than product tray by tilting the slab and feeding it into the blade. This product works as it should. Webstaurant's prices are by far the best around! I am a huge fan of all their items, so happy to have found Webstaurant! Great slicer. We have been using it for daily deli. Works great and no issues. We aren't high volume with the deli meats, but do cut with it each day without any issues. This is one great machine right here! Cleans and works amazing! Cuts to any thickness you want, from lunch-meats to steaks to pretty much anything you want! Overall, this is a good slicer. However, the backing plate got bent and we were told by the company that we must have dropped it. We literally haven't moved it since we've bought it. Kind of lame. This isn't webstaurant.com's fault of course. The knob's handle is made of plastic and will break if tightened really well. This slicer slices hams effortlessly. 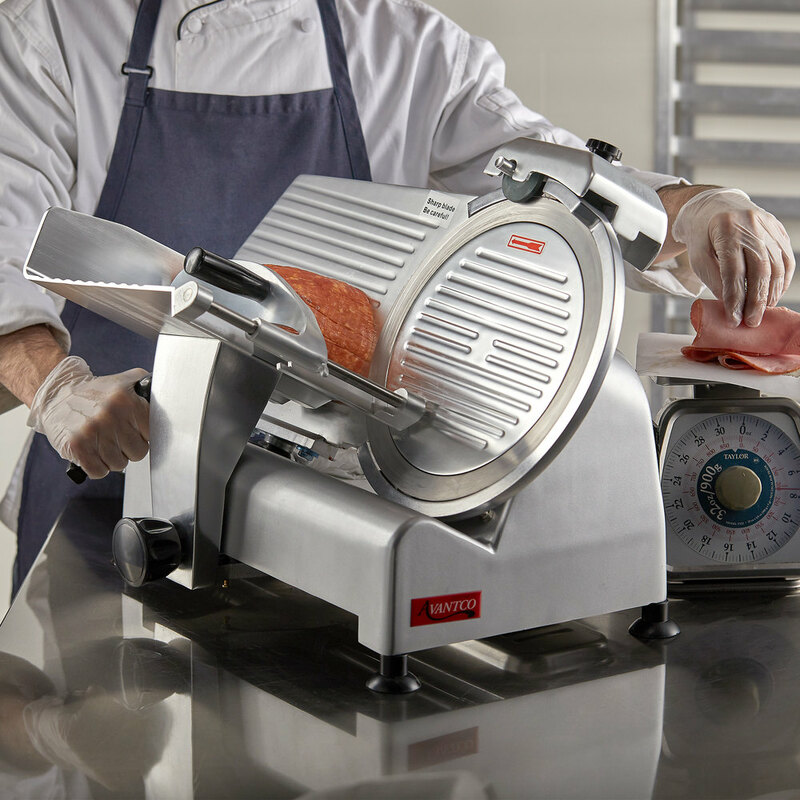 It is so simple to operate, that even first timers can get the hang of it and slice perfect slices. So far we are very happy with our new slicer. I can already tell that we will not have a lot of waste with this unit. Fairly light weight so we've told our employees to treat with care. Quality product at a real good price. Slices what we need to be sliced. Easy to clean. Also got the cleaning kit to keep it working right. Slicer works as advertised and is pretty easy to clean up. I feel that there is more overspray when slicing than my other brand slicer. I think this machine would be great for light duty...we may have over used it because the motor seems to be slowing down...but to be fair it did say for light duty. Strong construction, very high quality knife. Easy to wash, clean and operate. High quality aluminium construction. Perfect for bakerys, supermarket, cafeterias and all commercial kitchen. We ordered this slicer for our grille room. We are more than pleased with the price and function for our purpose. Glad for the websites suggestion, it saved us over 200 bucks over the other choice. The slicer has been a great addition to the kitchen. It works well and it is as described. It slices effectively and provides a consistent product.